Recent polls show Cook County officials could face electoral backlash for supporting the soda tax. Taxpayers have dealt with Cook County’s penny-per-ounce sugary drink tax for over a month and are showing their outrage. County commissioners could face electoral backlash if a recent poll is an indication. A We Ask America poll conducted on Aug. 30 asked registered voters if they were more or less likely to vote for commissioners who have supported the tax, according to a report by the Chicago Sun-Times. The Sun-Times reported polling numbers for five commissioners, four of whom voted for the tax and a fifth who has stated his approval of the tax, and all have seen reduced voter support. Over 50 percent of respondents in the five commissioners’ districts said they wouldn’t vote to re-elect their commissioner should he or she support the tax. For Cook County Board President Toni Preckwinkle, the numbers are far worse: Nearly 75 percent would not vote to re-elect her, according to an Aug. 15 We Ask America poll. In November 2016, Commissioners Luis Arroyo Jr., D-Chicago, Stanley Moore, D-Chicago, Deborah Sims, D-Chicago, and John Daley, D-Chicago, (among others) voted in favor of the tax increase. Now, likely voters suggest they won’t support re-election. The Sun-Times reported the We Ask America poll revealed Arroyo faces 53 percent opposition, Moore has nearly 65 percent of registered voters less likely to vote for him, Sims faces 54.5 percent voter opposition, and Daley has nearly 67 percent of voters balking at supporting him. This is more evidence of the unpopularity of the soda tax. Shortly after its implementation, a separate poll found nearly 87 percent of Cook County residents disapprove of the tax. The soda tax took effect Aug. 2 after a Cook County Circuit Court judge dismissed a lawsuit challenging the tax. For purchases in Chicago, the tax is added on top of the city’s 10.25 percent combined sales tax and 3 percent tax on nonalcoholic beverages. 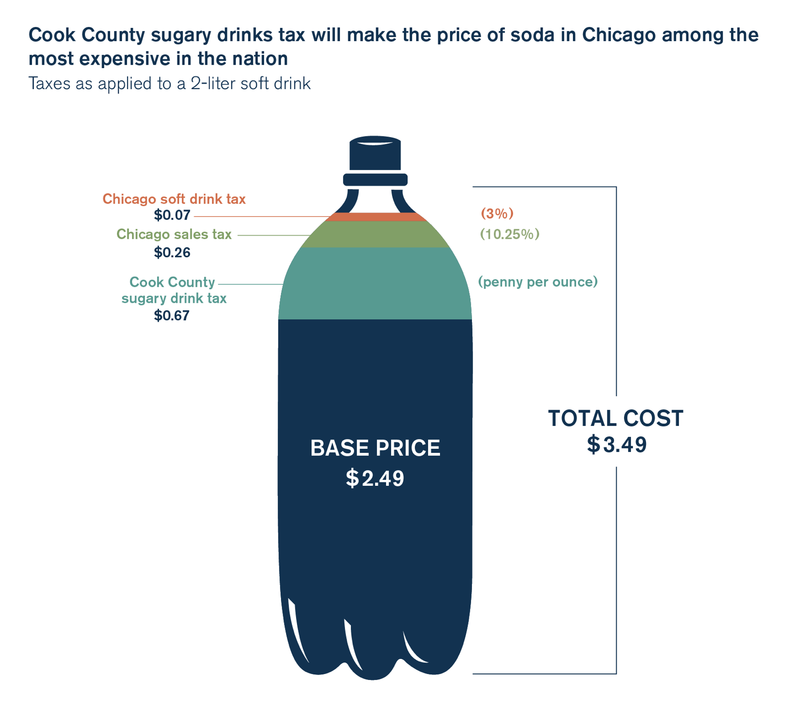 With the new sugary beverage tax, soda in Chicago is some of the most expensive in the nation, as a $2.49 2-liter bottle of soda will cost $3.49, an effective tax rate of 40 percent. Cook County officials expect the tax to bring in over $200 million a year in revenue to help close a budget gap, according to the Chicago Tribune. Despite the unpopular nature of the tax, Preckwinkle has defended the tax as a means to reduce consumption of sugar. However, it’s unlikely to help the most vulnerable population of the county, as people in the Supplemental Nutrition Assistance Program, or SNAP, are exempt from paying the tax. Due to federal regulations that prohibit applying state and local taxes to purchases made with food stamps, nearly 900,000 people who receive SNAP benefits won’t have to pay the sugary drink tax, according to the Chicago Tribune. Supporters of the tax celebrate it as a means to reduce the negative health effects of sugar consumption but refuse to see this tax for what it is: a cash grab. Instead of piling on residents who already face some of the highest property and sales taxes in the nation, the Cook County Board should find real solutions to the county’s fiscal crisis. Voters are expressing their displeasure over this notorious tax. Commissioners should listen.